From Capital Press, "The West's Ag website." While anecdotes of high rural unemployment have abounded during the depressed economy, state numbers suggest ag sector employment isn't suffering as much as other industries. That's despite some losses of ag jobs -- most notably in California's Central Valley, where water scarcity has resulted in some 300,000 acres of fallowed land while the state's water politics have roiled with images of unemployed workers waiting in food lines. But state numbers support the argument that rural unemployment emanates from other industries -- especially those, like construction, that employ large numbers of immigrants. Many unemployed workers settle in agricultural towns hoping to find farm work, boosting the area's apparent unemployment. An annual average of monthly farm employment in 2009 shows 389,225 people working in agriculture, down from 390,850 in 2008. That's a drop of less than 1 percent. As mentioned in the first part of this review, I think the biggest problem with the PPIC's new California Water Myths report is the inconsistency between it and their influential 2008 Comparing Futures report that recommended building the controversial peripheral canal. Their peripheral canal justification was deeply flawed and built on assumptions that the PPIC calls "myths" in their new report, yet they continue to promote the canal. The economic analysis in Comparing Futures suffers from 3 fatal flaws. 1. Grossly overstates future urban water demand and the cost of alternative water supplies. 2. Does not value environmental services or even the market values of recreation and fishing. 3. Ignores established scientific methods for evaluating investments over time which skews their analysis to favor big capital projects like canals. In late 2008, I posted a review of Comparing Futures that focused only on the first fatal flaw, and demonstrated that their analysis would probably favor reducing/eliminating Delta exports over a peripheral canal with more realistic assumptions. It generated a lot of tough questions for the PPIC, but Ellen Hanak and Jay Lund of the PPIC team brushed it aside, defended their assumptions, and did not show any results from appropriate sensitivity analysis to show their results were robust to alternative values, the same values they now cite as facts in Water Myths. Water Myths: In Myth #5, they explain at length the importance of measuring the economic value of environmental services and techniques scientists use to do it. Comparing Futures: They explicitly chose not to calculate a value for environmental services, because it is "too controversial." When they recommended a peripheral canal, they imposed their own unscientific opinion about these values since their scientific research showed other options had better environmental performance. Water Myths: In Figure 1, they correctly show that total urban water use in California has been decreasing even as population grows, thus per capita urban water demand is going down. Comparing Futures: Urban water demand is constructed with old estimates from when they built their model in the 1990s (before the decline in demand). They assume future water demand will grow at the same rate as population growth (no future conservation except what is induced by higher prices). This greatly inflates the value of future Delta water to urban users, helping to economically justify the peripheral canal. Comparing Futures: Made up a fictional DOF population forecast reference to a non-existent 2008 study to justify assuming 65 million Californians. Apparantly, it is easier to make up a reference to justify an aggressive number they built into their model for another study than to actually adjust the data. If you assume enough urban users (however unrealistic), you can justify the cost of a peripheral canal. Water Myths: Myth #3 says there is no silver bullet strategy, and cautions against overemphasizing a single solution. Comparing Futures: I hope they fired their media person, because the press release for this report clearly presented the peripheral canal as a silver bullet. The title was "Peripheral Canal is best strategy", not study weighs options, examines trade-offs, etc. To be fair, the details of the reports are more nuanced, but most of their op-eds and other pieces emphasize building the canal, and that message was the take away for 99% of the audience because of the way they present it. The effect of most of these inconsistencies is that the PPIC greatly overstates the value of a peripheral canal to southern California urban users. A non-technical way to illustrate it is to note that Ellen Hanak has pointed out that their study shows (and you can do it yourself on the spreadsheets on their site) that water exporters should be willing to pay up to $25 billion for a peripheral canal. However, some current news reports (corroborated by what I have heard through my admittedly poor location in the water gossip grapevine) suggest that many southern California urban water districts are not eager to pay the current $10 billion (and rising) price for a peripheral canal, because they have more cost-effective local options. I won't delve into the technicalities of the third fatal flaw at this point (maybe a future post if I want to flog this study even more). The bottom line is that the PPIC has very serious problems with the economics in their water reports. In addition to the errors in their peripheral canal analysis, the economists within this group botched the water jobs analysis this year (80,000 lost jobs, revised to 40,000 lost jobs, revised to 20,000 lost jobs, if they cut it in half for the 3rd time I will call it close enough), and now is promoting a specious argument that Central Valley Project water subsidies are a myth. It's very unfortunate, because an interdisciplinary research team like the PPIC/UC-Davis group could be a very positive force in the water debate. I suggest Dr. Moyle and the PPIC consider partnering with some other economic analysts. Click here to read part 1 of this review. From Matt Weiser's article on yesterday's NAS hearing in Davis. Peter Moyle, a fisheries biologist at the University of California, Davis, told the panel that diversions are the primary threat. "Other stressors" that water agencies often complain about, he said, are caused by water diversions, including invasive species and poor water quality. "Unfortunately the bottom line is, we've got to reduce the amount of water we export from the system," Moyle said. Scott Hamilton, an economist, focused his presentation to the panel on fall freshwater flows to the ocean. He spoke on behalf of the Coalition for a Sustainable Delta, where most of the officers work for Paramount Farms, the San Joaquin Valley farming enterprise owned by billionaire Stewart Resnick. Hamilton also works for Resnick as resource manager at Paramount Farms. Another presenter, Richard Deriso, analyzed Delta smelt population and survival data and told the panel that methods used by the U.S. Fish and Wildlife Service are "flawed." Deriso is chief scientist at the Inter-American Tropical Tuna Commission. He didn't say his analysis was done for the Metropolitan Water District of Southern California. Bill Bennett, a UC Davis fisheries ecologist and a leading expert on the smelt, shook his head as he sat in the audience during Deriso's presentation. "Some of them really believe what they find, but they don't know the ecological processes," Bennett said after the meeting. I know exactly what Dr. Bennett is feeling. It is exactly what most economists feel when they listen to civil engineers say that spending billions on dams and canals is good for the economy. Interdisciplinary work is important, but sometimes we need the scientists to stick to science, engineers to stick to engineering, and economists to stick to economics. Real Estate Optimism in Fresno? Fresno is the only place in the Valley where I've heard any optimistic talk about a turnaround in home building. Some quotes from an article in this weekend's Fresno Bee. "We're in heavy acquisition mode," said Asaro. If I were a developer, I would agree that Fresno is the only area between there and Sacramento where I would be interested in finished lots right now. Here are some graphs of vacancy rates (according to the Postal Service) we discussed in our latest forecast. 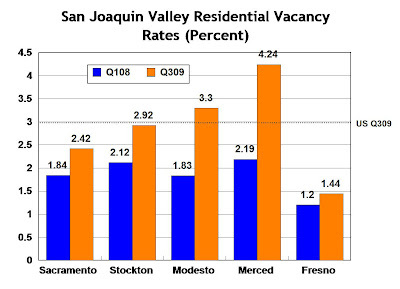 Note that Fresno residential vacancy has not increased much in the past 2 years, it looks more like the Bay Area than the Valley. 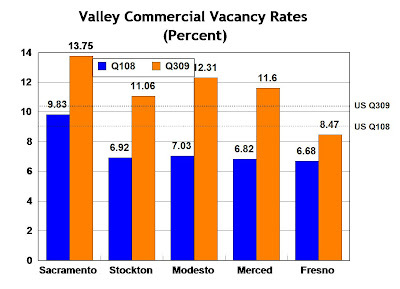 Commercial vacancy rates show the same trend. This is one of the reasons why we feel Fresno will be the first of these 5 Valley metro areas to recover from the recession. Here is a link to the Fresno Bee's article on our forecast released earlier this month, "Economic forecast less grim for Fresno". Just returned from watching Pacific men's basketball beat the Aggies for an amazing 49th consecutive time. Congratulations to Coach Thomason and the team for a great performance! I'll be in Davis on Feb. 10 to watch the streak grow to 50. Update 2/10: Davis ends the streak at 49 in a thriller. Students storm the court. Congrats to the Aggies. For California, the big story in the December data release is a very large monthly job loss after a few months of moving sideways in what we always felt was a false bottom. I do believe this drop of 38,000 jobs (on top of an 8,000 job downward revision for November) is finally putting us very close to the bottom statewide, but unemployment will likely drift up a few tenths from its current level of 12.4% this winter. In the Valley, the real shocking job loss story continues to be Sacramento. Despite the fact that state government employment is holding relatively steady, it continues to post the highest job loss month after month. This month, I think some Lake Tahoe blues are also mixing into the picture, but we see consistently very large declines in discretionary consumer sectors like restaurants (particularly full service) retail and higher end professional and scientific services are declining (which in Sac are very connected to state budgets, unlike in the Bay Area). Furloughs are definitely having an impact on unemployment in the area, as consumer wallets are clearly closed. If it weren't for disproportionately large declines in the Sacramento labor force, the 12.3% unemployment would surely be even higher. Other areas in the Valley continue to be weak and post very high unemployment, but nothing that jumps off the charts as a separation from historical and statewide trends like the Sacramento data. All these Central Valley metro areas will be rising to unemployment levels near 20% (and over in the case of Merced) as we hit the normal seasonal trough in farm employment. Fresno continues to fare slightly better than the others as it's unemployment remains about a percentage point below Modesto and Stockton (historically it is usually the other way around). In the Bay Area, you see the same story about the lackluster holiday season. Silicon Valley actually registered a slight gain in computer/tech manufacturing, adding another signal that this sector has bottomed and is ready to grow again. San Francisco registered a disapointing one-month drop in jobs (-5000 seasonally adjusted), but it looks like it could be a data anomaly in the government sector rather that will disapear with revisions. The annual benchmark revisions will be the next release on March 5, and the expectation is that most revisions of 2008 will be downward. We are currently standing at 1.05 million jobs lost in the recession statewide, but the revised data will almost certainly put the total over 1.1 million next month. Stockton is the largest metro area in California without a 4-year public university. I think Pacific does an exceptional (and getting better) job at community engagement for a private university, but the reality is Stockton badly needs a public university to round out it's higher education options. As pointed out in Michael Fitzgerald's column in today's Stockton Record, the CSU-Stanislaus Center downtown offers little. Many of Delta College's best and brightest have to leave town to finish their degrees and never return. (I was pleasantly surprised to learn how many Delta transfers we had at Pacific, but it is only a tiny piece in the demand). Fitzgerald's article utilizes several quotes from a report we did this summer on employment and wages in San Joaquin County. The full report is available here for anyone who wishes to see the details. As a bit of trivia, we did a bit of research in the Center and learned that Stockton is not the largest metro area in the U.S. without a 4-year public university (our critieria was that a branch campus must have at least 1,000 full-time students to qualify). That (dis)honor goes to Bethlehem-Allentown-Easton, PA (#62 in pop). Poughkeepsie-Newburgh-Middletown NY (#77 in population) also does not have a 4-year public and is 1 slot about #78 Stockton in the population rankings. The objective of the PPIC Water Myths report is to get the facts straight, so that California water discussions can be "rebuilt on myth free foundations." That's a worthy goal, and it appears to me that the majority of the facts in the report are correct. But the PPIC continues to show a troubling tendency of downplaying their own mistakes and outright bias towards some stakeholders. The biggest problem is serious inconsistencies with their far more influential 2008 report that endorsed the controversial peripheral canal. Although they tout the 2008 report repeatedly in Water Myths, much of their 2008 study was based on arguments and facts that they are now calling myths. Next week, I will discuss this in detail in Part 2 of the review. The current focus is a few parts that raise questions about the seriousness of the PPIC's committment to neutrality and myth busting. At various points in Water Myths, the PPIC team 1) blames others for myths they created, 2) creates a new myth, and 3) shows bias for certain stakeholders. The PPIC correctly points out that the Endangered Species Act is not the villian. have reduced water supplies available for some water users. However, the effects are often overstated. It is good to see this important point in the report, but it is rude for them to scold south of Delta agricultural interests for overstating the effects of reduced water supplies. After all, the statement that 40,000 (or 80,000) lost jobs has been the most pervasive myth in the water debate this year. Most overstatements of the effect are simply citing the discredited UC-Davis studies (written by authors of the PPIC Water Myth report). While they are no longer standing behind these reports, they have not formally withdrawn them and they continue to be referenced. Instead of lecturing others for citing them, perhaps they should apologize for their role in misleading the public. In fact, it is the University of the Pacific Business Forecasting Center that is responsible for busting this myth (here and more recently here), but there is no reference to this in PPIC Water Myths. After we showed why their job loss estimates were 500% too high and pointed out that the majority of financial loss was to farmers not poor farm workers (who have indeed been hurt), UC-Davis quietly revised their estimates and revealed that their earlier reports mistakenly modeled the loss of millions in farm revenue as if it was all a direct loss to the revenue to farm labor contractors. Their explanation for this very serious error was to reveal that they actually didn't do the jobs estimates themselves, but were reporting results produced by state water agency staff (without attribution). Clearly, the relationship between this research group at UC-Davis and their funding agencies has become a little too cozy. The "No Villians" section on subsidized agricultural water users (such as Westlands Water District) starts off with a novel argument for why these farmers aren't really subsidized in their view. Are they creating a new myth? This is an interesting hypothesis, but they present it here as fact without providing any data or evidence. Do they have data on land sales and land ownership in the Central Valley Project area? I didn't know it had all changed hands recently. That conflicts with all the media reports about families who have been farming in this area for generations, and that the data from farmland appraisers and USDA shows the value of local farmland has appreciated tremendously over the past decade. The sole 25 year old reference they give isn't a study of land sales, but is of farmland lease rates in 1982. It's a nice paper that I enjoyed reviewing, but all it says is that water subsidies were fully capitalized in annual lease rates 28 years ago. (and some interesting implications for CVP acreage limits). There is nothing about how much land has changed hands or prices. The most publicized section of the report described why they feel major stakeholders (southern california urban users, subsidized Central Valley Project farmers, and environmentalists) are not the villians they are sometimes portrayed. Each of these stakeholder groups has a very positive section intended to cast them in a more positive light. Although these positive descriptions are a bit of a reach in some places (see above), it is nice to see a positive tone. In the final myth (#8), the report explains that a solution that makes all stakeholders happy is impossible, and some groups are going to have to give up some of their positions. Given the positive, one-sided descriptions of three major stakeholders in Myth #2; a fair and balanced report would now give an example of a tough compromise each of these 3 stakeholder groups might have to make. Instead, the PPIC introduces a 4th important stakeholder group to their story for the very first time (the people of the Delta itself), when they need to give an example of throwing a stakeholder in front of the bus. The Delta doesn't get the positive treatment of the 3 other major stakeholder groups in the "No Villian" section (and they certainly would not have to strain any harder than they did for Central Valley Project farmers to do it). Instead, they fuel the villian portrayal of Delta farmers as selfish actors who only care about public subsidies for their levees and stand for the "status quo." I don't have a problem with the tough questions the PPIC/UC-Davis team likes to ask of in-Delta farmers and residents. However, it is unbelievable to see supposedly unbiased academics give Westlands a free pass while they give the Delta an interrogation. And so it begins with the NUMMI supplier shut-downs: Stockton Auto Parts Supplier to Lay Off Entire Workforce. 159 good jobs gone (and as a sign of how unexpected this auto collapse was, note that this facility just opened in 2008). Kyoho is only 1 of 10 NUMMI parts suppliers in San Joaquin County. At least this recycled bottle plant is encouraging. It is going to take at least 50 of these types of announcements to make up for what we are losing with NUMMI. We will get there, but there's a long slog ahead. Update: Accidently wrote the company's name was Kyoto not Kyoho in the original post. Climate change on the mind I guess. As an economist who is skeptical of sports arena deals, this 3-way swap proposal (Arco Arena, CalExpo, downtown Sac railyard) described in this morning's Sacramento Bee sounds like the kind of bold, creative idea that could actually work. I look forward to learning more about it. Does the NBA know anything about water? We have actors and comedians working on the case, why not professional athletes? Speaking of CalExpo, I wonder if anyone has ever seriously proposed the idea of moving the State Fair to the Mendota/Firebaugh area and having it in the Spring when schools are on break, the weather is nice, and the harvest season has yet to ramp up in the Valley. I am envisioning a fairgrounds developed on fallowed fields with a restored San Joaquin river flowing nearby. I can't think of a more educational setting that would show people where their food really comes from, while showcasing how environmental protection and agricultural production can co-exist to create a more prosperous and diverse economy. The area could really use the jobs (especially during the early spring), and it would generate a ton of sales tax revenue for these strapped communities. It might lead to some decent temporary housing that could work for both the fair and migrant laborers in the summer/fall. It seems like a concept that someone like John Bass (Delta National Park) could develop into something interesting. I doubt it would be as profitable as Sacramento, but there might be some public benefit worth subsidizing. In the previous post, I chided Restore the Delta for attacking Lester Snow, Director of the Department of Water Resources. On reflection, it is somewhat uneven for me to lecture Restore the Delta about disrespecting Lester Snow without mentioning how little respect I have personally received from the Department of Water Resources this year. Three things come to mind. Two weeks later, DWR's California Water News circulated a response to my article full of personal attacks that went so far as to call me racist. DWR ran the personal attack as the lead article of their top stories without adding an opinion label. So DWR didn't attack me personally, they just approvingly forwarded someone else's attack to all their employees as the most important news of the day. As for whether these reports are racist, two real Latino grassroots groups (Coalition of Mexican-American Associations and Hispanics for Political Action) invited me to speak about this and no one has been offended - in fact they applauded. That is two more invitations than I have received from DWR staff. When question time finally arrived, Lester Snow announced that they were changing the format to public comments rather than Q&A. He said the questions were too specific for the forum, and they would respond to them directly in a few days. Since I had written a specific question instead of comment, I followed his instructions and didn't go to the microphone to comment. Five months later, and I'm still waiting for an answer to my very simple "yes or no" question. There is no mention of why they were suddenly scrambling to revise their numbers or that many people were citing a very different estimate from a credible source. On September 28 a team of UC Davis researchers led by Dr. Richard Howitt revised their forecasts of 2009 water shortage employment impacts... DWR economists will use these new forecasts in their research on the economic impacts of the water shortages. Still no mention of other estimates or an explanation of why they were sticking with the same source that misled them all year. I guess they didn't hear there was something else out there. Maybe someone reading this will tell them about our latest update of 8,500 jobs. If they have read it, I would be very interested in why they think the UC-Davis estimate is more accurate. I don't blame DWR for ignoring our reports and commentary at first, and have no hard feelings (really) despite the complaints above. They don't know me, and I haven't been around these water issues for all that long (of course, that doesn't seem to stop them from seeking the expert analysis of comedian Paul Rodriguez). However, at this point, I think they at least owe me a citation and an answer to my simple question. Should I Thank Restore the Delta? did you have to do it in the same message where you insult Lester Snow? I disagree with their comments about Lester Snow. I do agree (and have said repeatedly) that DWR under Snow has failed to sponsor appropriate independent economic analysis of their proposals, including the peripheral canal. I hope he ignores the personal attack from Restore the Delta and still considers the substance of their request about economic analysis. No, I don't think I should lead it but I think it would be good if I were substantively involved. Final Disclosure: I have had reporters ask me directly if I were a member of Restore the Delta (apparantly someone in the Fresno area was telling reporters that I was). For the record, I don't think I have even met Barbara Barrigan-Parilla (sorry if I forgot, Barbara) and am not a member of Restore the Delta. I have met Jane Wagner-Tyack several times, and exchanged a few emails with Barbara (some of them actually defending UC-Davis economists). I attended one of their workshops last winter at my own expense. They gave me a very pretty bumpersticker that I had on my car for several months. I scraped it off this summer when their rhetoric began to escalate, and I realized the sticker was no longer just a pretty picture with a nice slogan. Today's NY Times has one of the dumbest columns Paul Krugman has ever written. Actually, Europe’s economic success should be obvious even without statistics. For those Americans who have visited Paris: did it look poor and backward? What about Frankfurt or London? You should always bear in mind that when the question is which to believe — official economic statistics or your own lying eyes — the eyes have it. In any case, the statistics confirm what the eyes see. It’s true that the U.S. economy has grown faster than that of Europe for the past generation. Since 1980 — when our politics took a sharp turn to the right, while Europe’s didn’t — America’s real G.D.P. has grown, on average, 3 percent per year. Meanwhile, the E.U. 15 — the bloc of 15 countries that were members of the European Union before it was enlarged to include a number of former Communist nations — has grown only 2.2 percent a year. America rules! Or maybe not. All this really says is that we’ve had faster population growth. Since 1980, per capita real G.D.P. — which is what matters for living standards — has risen at about the same rate in America and in the E.U. 15: 1.95 percent a year here; 1.83 percent there. First, a little math. Compounded over 30 years, the difference between 1.95% growth and 1.83% growth is about 6.5%. That's about $2,000 more in per capita income growth, which I would call significant, although not the difference between defining rich and poor. But, it's an even more impressive that the U.S. grew faster when you consider that the U.S. starts with significantly higher income than the EU average, and you would generally expect the lower income group of countries to grow faster. Plus, he notes the difference in population growth. Our population is younger and has higher immigration, groups that tend to have lower per capita incomes than the older and native born. That should depress our per capita numbers, and make it harder for us to outgrow the EU. So, does that mean the U.S. is better than Europe. No, it is different, and it depends on your preferences which system is better. I think both are great places, and this is a good illustration of what economists call the equity-efficiency trade-off. Krugman is putting words in other people's mouths and being very deceptive with the data. Harvard economist Greg Mankiw shows the average income data Krugman doesn't cite here. A few weeks ago, environmental journalistss/advocates Dan Bacher and Lloyd Carter, published some data and rough calculations about Westlands Water Districts economic contributions. They make a good point, that Westlands is about 0.25% of U.S. agricultural production, so risks to Westlands production is hardly a national food security crisis as their supporters claim. In fact, I think this number actually overstates their national importance, because there are numerous substitution opportunities. In the next part of their essay, Bacher/Carter overreach with some very rough calculations intended to argue that Westlands makes no net contribution to the economy. They are trying to distinguish between output value, farm income, and the value of the crops to society (what they call "true wealth.") They are right that government subsidies and pollution costs mean that the value of these crops to society is less than the value of output. However, they aren't measuring it correctly here and overstate their case (not to mention the obvious issue of using national figures for net farm income across all crops is extremely rough, and that they round down in several places such as 1/6 of $1 billion is $166 million not $150 million). First, they should use "value added" rather than net farm income. Value added measures all the income generated by the farm and includes wages and other income payments that are part of the production expenses that are subtracted from revenue to get net farm income. Netting out the social costs from income/value added is more complex than it is portrayed here as well. I wondered if anyone would try to respond to Carter/Bacher, and Mike Wade of the California Farm Water Coalition did in this piece. Carter/Bacher are stretching the numbers, but Wade takes numerical deception to the next level. Carter argues that the farmers are only earning $30 million in what he calls "true net" income. By his cracked logic, that works out to about $50,000 per family, which makes one wonder how they stay in business and why Carter and Bacher are always denouncing them as millionaires. Wade is blatantly misrepresenting their article, the $30-40 million estimate was social value, not income to Westlands farmers, which Bacher/Carter clearly state they estimated at about $150 million. Divided by the 600 farms (roughly 1,000 acres each) in Westlands, that is $250,000 in income per farm, not $50,000 as Wade claims. Of course, those farms are actually fewer and larger than Wade claims, as that would be $250,000 income per family member who owns the 1,000 acre limit, and many of these are often combined into one family farm. Of course, these numbers are awfully rough, but it isn't hard to see how one of these family farms could earn millions in income each year, and be very profitable. Westlands should show a bit more gratitude to US taxpayers and Congress for making their prosperity possible. I won't quote here, but Wade goes on to repeat a whole bunch of other exagerrations. 1. 21,000 jobs lost from water crisis (at least he isn't using the worst exaggerations here, but still way too high) 2. that $1 billion in farm output generates an additional $3.5 billion in other business in the region (where did they get a multiplier of 4.5? it's ridiculously high) 3. Westlands production couldn't be replaced by others (wrong) 4. an irrelevant factoid that California is 4% of nation's farms and 12.8% of output (the debate is about Westlands not California agriculture as a whole, and this fact just shows that California farms are very large). There is no question that to maintain this kind of prosperity, California has to address its water problems. Bacher and Carter, unfortunately, are not contributing to a solution. Prosperity? Westlands is the poorest place in California even when they have water, although the landowners do quite well. Is that what he means by "this kind of prosperity." I agree that this Bacher/Carter piece didn't contribute much, but neither is Wade. It looks like Aquafornia posted this high on their scroll, and it's getting quite a few hits. I guess Mondays are slow for water news. Please recognize that this is a blog musing I typed while watching the NFL playoffs yesterday afternoon, hardly a research piece. In particular, my comments on the Bacher/Carter piece are a little off. The point about value added is that income generated for people by Westlands farming is more than net farm income, and that trying to come up with some comprehensive measure of the total contribution of Westlands ag. to the economy is a lot more complicated than what they are doing here. On a second reading, it looks they are trying to assess whether Westlands would be profitable without government help. But this concept is confused with "true wealth" and income, the numbers are so crudely estimated, it is all a bit confusing. The capital costs of the Central Valley Project are a sunk cost (but are a big part of the subsidy Bacher/Carter mention). This is a legitimate distributional issue, but we can confuse the question of "should we have built the CVP in the first place?" with "should we continuing farming on the westside today?" Very different questions. Similar to comparing should we have built a dam at Hetch Hetchy, to should we tear it down now that we have done it. Wade's piece isn't much more than a clumsy attempt to make Carter/Bacher's numbers seem wrong, and a repeat of the usual exaggerated economic points made by Delta water exporters. The point about the national share of output shouldn't be construed as indifference. The same can be said for any of us. University of the Pacific could shut its doors tomorrow, and U.S. education would hardly notice. That doesn't mean it wouldn't cause a lot of pain locally. The only reason this point has to be made is that some are asserting that cutbacks in westside agr production is a national security threat, U.S. citizens will be poisoned by chinese food, food prices will skyrocket, and other crazy assertions. This is a local economic problem, not a national economic threat. Bottom line, I recommend ignoring both of these articles. I probably should have followed my own advice and ignored them too. Yesterday was the state of the state speech. I agree with many sentiments in the speech: protect education funding, cut prison costs, reform tax code, cut state pensions. Yes to all, but I doubt we will see much on these initiatives. What about the jobs proposal? Particularly, $500 million for worker training subsidies and $200 million for first time home buyer tax credits. Why should a business get financial incentives to hire someone who a) is currently receiving unemployment, and b) needs training for the job; over another person who may not be in either category? Is there something wrong with hiring a new graduate or perhaps a spouse or family member of someone who is unemployed? What about someone who already has the skills? If you want to subsidize new hires, just do it directly, don't bother with these hoops. Second, the $200 million in home buyer tax credits is just bad policy. The original $100 million was popular, but where is the evidence that it actually stimulated construction - I can't see it in the data at all. And it is inequitable. The primary people who benefit are home buyers (who are already profiting from the bust) and realtors for whom transactions = commissions. The resources are far better directed at mitigating preventable foreclosures. The most important thing the Governor can do to help jobs this year is credibly balance the budget, and restore the state's bond rating. We are wasting millions on unnecessary interest expenses, and investors (not just bond buyers) in California are nervous about the state's long-term finances and political disfunction. Throwing another $800 million of new spending into the mix (that I believe is mostly transfers, unfair, and will generate little real growth) just makes the job of balancing the budget on time that much tougher. The budget proposal released tomorrow is much more important than any of these new jobs proposals from yesterday. The Governor today called the state budget crisis "our Katrina." Some Valley Congressman have called the water crisis "our Katrina." Yes, they are problems, but I would be pretty offended by this if I were from New Orleans, and it makes our leaders sound a bit out of touch in my opinion. The estimates I have seen for Katrina's damage range from $70-$150 billion. Over 1,000 people were killed. Gas prices spiked across the country, etc. Follow this link for a summary of our latest economic forecast. I won't repeat the summary here. Follow this link to an interesting graphic on real estate price trends around the globe in the Economist magazine. I recommend Japan, Britain, France, Spain, and South Africa for interesting comparisons. Richard Pombo is announcing his candidacy for George Radanovich's Congressional seat. This got my attention. I have never met Pombo and moved to the area after he lost reelection to Congress. However, we are loosely connected in some ways. Pombo, in part, inspired my 1990s dissertation research on the impacts of the Endangered Species Act in North Carolina. That study was the first objective, academic study to confirm the perverse private landonwer incentives often cited by Pombo and other property rights activists against the ESA. Thus, for a period of time early in this decade, our names often appeared together in anti-ESA articles (I found this one on Google, but there were more including the Wall Street Journal). In addition, Pombo helped secure the initial funding to support the start up of the Business Forecasting Center at Pacific in 2003-05 (many years before I came to Pacific and took over as Director, I didn't learn of the coincidence until after I accepted the job). I suspect he and others are less pleased with some of my more recent ESA studies on the employment effects of the Delta Smelt restrictions. However, it is conducted in the exact same spirit as the woodpecker studies that property rights activists loved. It is merely testing to see if anecdotes and political rhetoric around the ESA stands up to an unbiased analysis of the data. I share many of Pombo's property rights concerns regarding the ESA. Although Pombo's ESA reform bill didn't pass (and it had good and bad provisions), I give him credit for forcing environmentalists to face up to the problems with the ESA on private lands. I think the ESA works better today, and is implemented much more flexibly as a result. However, the water issues surrounding the endangered Delta Smelt are not property rights issues (and don't get me started on groundwater). There is a difference between Kangaroo Rat and Kit Fox habitat, and Delta Smelt and Salmon. There is a difference between defending private property rights and defending the Central Valley Project. I suspect he understands that, and I am genuinely interested in hearing him discuss the issue in more detail as the campaign evolves. I know nothing about Pombo's record or views outside of the ESA issue (it was a national issue and I lived across the country when he was in Congress), and have no idea if he is an effective legislator for the Valley. All I hope is that Pombo and other Congressional candidates in the Valley substantively address the foreclosure issue and other serious Valley economic problems, and do not allow water and the concerns of large landowners to completely dominate the race. Update 1/5: This article from the Record is not encouraging. He says it is all the same issues as when he was in Congress, and it is all about water and agriculture. That is disapointing, because in fact the biggest problem in the Central Valley is foreclosures, a problem that wasn't even on the radar screen when he left Congress in 2006. Some clarification on my "some good, some bad" comment on Pombo's ESA reform bill for those familiar with ESA details. Economically, the good was landowner incentives and no surprises, the bad was the takings provisions (although I support property rights, my concerns about regulatory takings are economically technical and stem from it creating an entirely new set of perverse ESA incentives as well as problems with how appraisers typically overestimate the lost property value - leading to potential windfall payments to landowners from taxpayers). There were other provisions on science, listing, critical habitat and other components to the law that are fuzzy in my mind and I am not the best person to evaluate anyway. My impression was always that the bill never had a chance and I didn't study it in great detail. I also had no idea how young he is. I assumed he was an old veteran who retired after he lost election. He must have been in his early 30s when he was first elected. Update 1/6: Mike Fitzgerald from the Stockton Record offers, as usual, an interesting commentary. Back in September, I noted that Treasury was planning to encourage short sales. In todays New York Times, there is an interesting comment in a larger story on why the loan modification program is not working. that allow delinquent borrowers to hand over their deeds in lieu of foreclosing. I have to wonder if the current "homeowner" could actually afford their house at the short sale price (below their current mortgage balance). I think of someone in the Valley with a $300,000 mortgage on a house currently worth $150,000. However, they can't get their principal reduced to $150,000, but it sounds like the government will encourage a bank to do a short sale so that someone else can own the house for $150,000. I have a hard time figuring out how this is better for the economy than a serious principal reduction program. I guess it's better for real estate agents as transactions = commissions. But it also damages property, neighborhoods, and families.